Broadly speaking, almost all residential systems based on alternative energy -- such as geothermal heating/cooling systems, solar heating systems, solar hot water systems, solar and wind electric systems -- do not represent good investments, because these systems are still very expensive. Even with tax credits and government incentives, one can expect to get a return on this investment only after 10-15 years. In addition, some of these systems are still not very efficient. For example, an efficiency of almost all solar panels is around 15-20 percent, and the efficiency of almost all "flat plate" solar collectors is close to zero during cloudy or snowy days. More importantly, sometimes the technical characteristics of the solar systems, presented by their manufacturers, are incorrect. For example, Silicon Solar company stated that its Solar radiant heating kits HH-1000 are designed to assist in offsetting 192 gallons of heating oil annually for a 1000 square foot house. However, as we know, one gallon of #2 fuel oil = 138,500 BTU's (British thermal unit). Therefore, one should multiply 192 gallons of heating oil by 138,500 BTUs, which equals 26,592,000 BTUs. I think, that the HH-1000 kit cannot produce this amount of BTUs. To prove my statement I would like to provide	my calculations. Each Silicon Solar HH-1000 Kit contains two SunMaxx-30 solar collectors. And according to the SRCC (Solar Rating & Certification Corporation) one SunMaxx-30 solar collector can produce a maximum	of 42,400 BTUs in warm climate	during clear days and 19,200 BTUs during cloudy days. 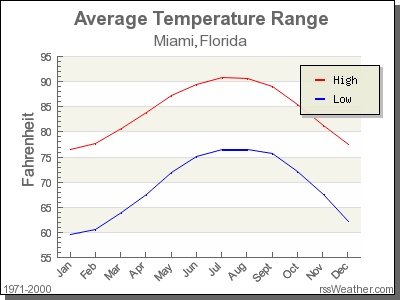 We also know, that not all 365(366) days in a year are clear EVEN in warm climates, such as in Miami. Therefore, we cannot multiply 76,000 BTUs (two SunMaxx -30) by 365 days. In addition, there are no reasons to heat a house 365 days a year in a warm climate. a).Warm climate: SunMaxx -30 average performances is 30,800 BTUs/day ((42,400 + 19,200) /2). SRCC provides the same amount of BTUs for the mildly cloudy days. Therefore, during four heating months, two SunMaxx-30 collectors can produce roughly 7,515,200 BTUs (30,800 BTUs x 2 collectors x 122 days). That means that just 54.26 gallons of heating #2 oil could be offset (7,515,200 BTUs /138,500 BTUs per gallon). SunMaxx -30 average performance is 24,000 BTUs/day ((35,4000 + 12,600)/2). Therefore, in nine heating months two SunMaxx -30 collectors can produce roughly 13,104,000 BTUs (24,000 BTUs x 2 collectors x 273 days). That means that just 94,61 gallons of heating #2 oil could be offset (13,104,000 BTUs/138,500 BTUs per gallon). In real life, we should further reduce these numbers because of the losses that occur in heat exchangers, solar storage tanks and transfer pipes. My experience of working with homeowners demonstrates that most of them are conservative investors, who are not receptive to drastic changes or unplanned investments. Likewise, motivation to "do something good for the environment" is lacking, since the economy is relatively weak. For example, in my township of Neversink, only one homeowner has installed a geothermal heating/cooling system! As such, chances of selling any solar radiant/space heating systems, with a price tag of 10,000 dollars, are small. Scenario number one: buying a solar radiant/space heating kit to modify an existing heating system. The cost of the cheapest modification kit for the house of 1000 square feet and installation could start at 12,000 dollars. After	receiving all tax credits, rebates and government incentives, the customer could get the cost of equipment reduced by up to 50% or a discount of approximately 40% from the total cost. This investment in the amount of $7,200 (60% of initial cost of system) could offset less than 100 gallons of heating oil, or could save	roughly $250 annually at the current heating oil prices. To calculate the potential	reimbursement period in	years (even without additional maintenance costs), we have to divide the cost of the system by the amount of annual savings. In other words, the investment return period is over 28 years ($7,200 / $250 = 28.8 years). At the end of this period, the system would be worth its "residual value". Scenario number two: Depositing $7,200 into a long-term CD account, instead of buying a solar heating system. Even with a low annual interest rate of 3.5 percent, a long-term CD could generate savings in the amount of $19,156.74 over 28 years. However, because there is no oil cost offset, the customer would spend an additional $7,200 in 28.8 years ($250 annually) for heating costs. Therefore, we have to subtract this amount from the total savings amount to get a total profit: $19,156.74 - $7,200 = $11,956.74. Scenario number three: Bank loans or manufacturer/supplier financing is possible, but less likely. These two simplified calculations show that because the first option requires a waiting period of more than 28	years for the investment to pay off, this option does not appear more attractive than the less complicated investment in option number two. Is there a way to be green and profitable simultaneously? I think the answer is "Yes,"if we start with a less	expensive, but a more attractive supplemental heating systems, which offer a reimbursement period of not more than	5 years. Click here to see detailed information about my idea, which could be replicated by any person with minimal	plumbing knowledge. 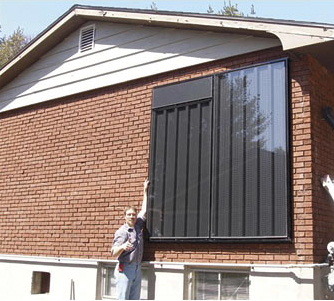 Self-powered solar air collector provides space heat for rooms when the sun is shining. Can heat up to 1000 sq. ft., depending on the building insulation. Air is drawn from inside the room through the bottom of the collector, heated and blown out through a duct in the top. Integrated solar panel provides electricity for fan operation. Unit is a supplemental heating system and does not replace existing furnace. Approved by the Solar Rating and Certification Corp. (SRCC) for SRCC OG-100 certification. Dual solar air collector system is designed to provide supplemental heat for rooms up to 1500 sq. ft. 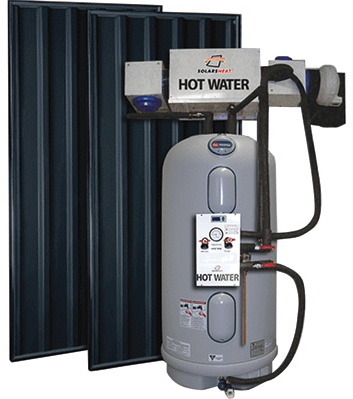 The SolarSheat® Hot Water System is an innovative dual mode solar air space heating system for the winter and a supplemental solar domestic hot water system in the summer. The SolarSheat uses household water and does not require glycol or other additives. The system uses automatic dampers and can switch between heating and hot water modes quickly. Federal Energy Management Program (FEMP) Maps - you have to read this!